I've been dying to share a picture of this new haircut's version of bedhead. So a belated top o' the mornin' to ya on this deliciously lazy free-from-all-labor day. I love your hair. And that is a wonderful mohawk. And do you really look that great just out of bed? Lucky gal. You look like every wanna be chef on Top Chef. And they make their hair look like that on purpose. If this is a throw-down, I'll show you mine, and beat ya. I guess it depends on your definition of "good," Megan; when my husband rolled over and saw me this morning he said, "You look like a Euro punk rock chick." And Mom, now that your hair is shorter I can take you strand for strand. That is fantastic! I have a super short do and mine has yet to get that high! Way to go! Wow, that is so damn incredible. I love bed head! And seriously, yours looks very cute. 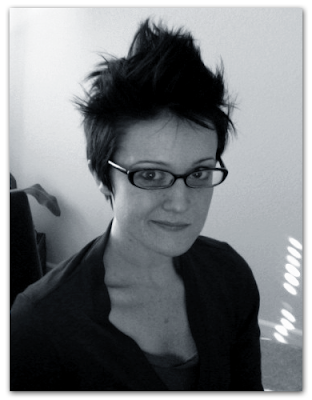 so, since we have pretty much the same haircut (by the same fantastic lady, no less!) I completely understand this bedhead. however, I think it's safe to assume that you don't follow my lead and, on lazy days, just hairspray the hell out of it. sometimes I wish my husband had a bit more fashion sense, as I often realize, after the fact, that my look was not the best choice for public viewing. that is awesome! amazing that it is so symmetrical. how did you get it to do that in your sleep? now THAT'S some talent! I'd like to see the time lapse video of how that was created. Does the Husband get any sleep? With you thrashing to and fro?